A combination of a two-dimensional platformer and a logic game created by the independent studio Brainseed Factory. The player assumes the role of an original protagonist, composed of four letters: "H", "E", "R" and "O", who traverses a dark world filled with threats. Typoman was created by Brainseed Factory - an independent developer. Initially, the game was released exclusively on Nintendo Wii U, but a re-edition titled Typoman: Revised was later created for PC, PlayStation 4 and Xbox One. In Typoman for PS4, PC and etc., the player takes on the role of a character made of a few letters - "H", "E", "R" and "O". The adventure begins when the protagonist gets thrown out of a truck trailer at a place that resembles a junkyard. The character explores a dark world filled with threats, avoiding countless traps on their way and solving puzzles requiring the player to manipulate with letters. When it comes to the mechanics, the game is based on two pillars. The first, which distinguishes Typoman among other titles, is manipulating with letters and creating new words from them. This is how the protagonist controls elements of the hostile environment, builds and raises platforms, as well as unlocks new paths in order to access new locations. For instance, in order to open a gate, the player has to assemble the word "OPEN" with the four words given. This can pose a serious difficulty to those unfamiliar with English. In fact, knowledge of English is necessary for being able to experience the game fluently, even though the plot itself is not rich in words. A system of tips is of some help, because when it is necessary, the player can have a text displayed, which contains the word needed. The second pillar the experience was based on, are the platformer elements. During their journey, the protagonist has to avoid traps, jump over obstacles and across platforms which often move in two planes. Moreover, the player encounters different monsters capable of tearing the protagonist into shreds. Similar to the protagonist, the monsters can manipulate with letters - the player fights them through creating antonyms. In order to reduce frustration caused by the protagonist dying very often (the game plays tricks on the player from time to time), the creators implemented a system of checkpoints. 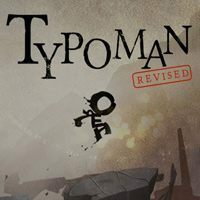 Typoman for PS4, PC and etc. offers a two-dimensional environment and the game is played from a side view, as in classic platformers. The visuals can be appealing to many, for a gloomy atmosphere gets intensified here by a minimalistic color palette. Majority of the in-game objects present different shades of grey, though elements with more lively colors also make their presence here - especially different objects of interest. A soundtrack was created specifically for the game; it was composed by musicians belonging to the Dutch SonicPicnic. As compared to the original Wii U edition, the Revised version comes with higher resolution settings and a larger number of frames per second.